SWAMPSCOTT, MA – October 27, 2017 – Following a recent grand opening, Longwood Care, a local behavioral health non-profit, has received $10,000 to provide youth mentoring services in the community. The donation made by Alegre Dental will provide more than 400 community service hours for the Youth Mentoring Initiative. The funds will support existing organizations and community partners in alleviating long waitlists for individuals seeking youth therapeutic mentors. Youth mentoring supports many at-risk individuals by pairing them up with a qualified mentor, who in turn models proper behavior while also providing therapeutic support. Of those at-risk who had a mentor, 99% found the experience helpful in many aspects of life, such as involvement in extracurricular activities and pursuing of higher education. Although studies suggest improvements and positive results for clients, today behavioral health providers must wade through insurance policy all the while telling people who need the service to wait. According to statistics, 1 in 3 young people will grow up without a mentor and it is uncommon for many individuals seeking a therapeutic mentor to be on a waitlist for 9-12 months. The lack of availability may result in a large percentage of the at-risk population from ever having a mentor. Youth therapeutic mentoring services are unique in that they are dedicated to help children, adolescents and teens learn to better understand and communicate feelings, relate to others and build positive relationships. In addition, therapeutic mentors are required to have a minimum of a BS/BA in a related field such psychology with supervision and oversight from a board licensed therapist, psychologist, social worker or mental health counselor, providing additional insight and understanding that is often required by clients. 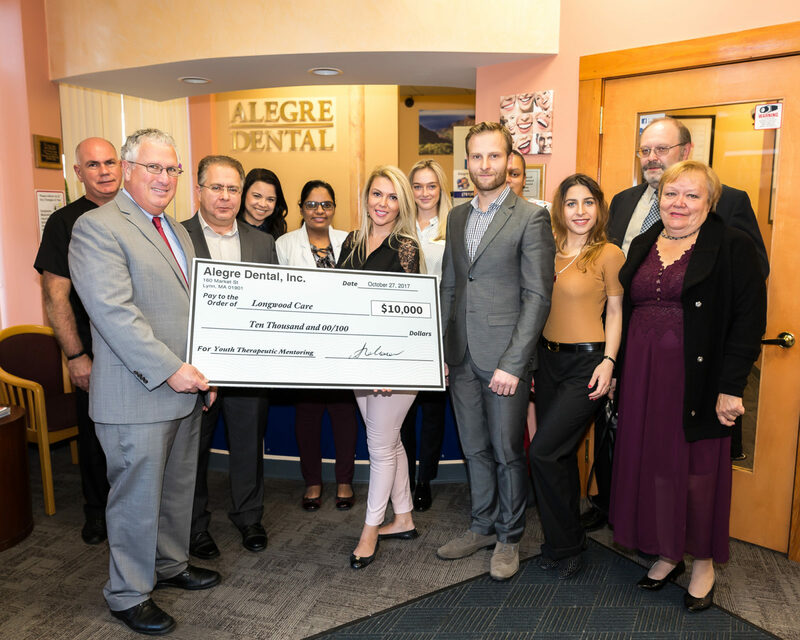 With continued support from organizations like Alegre Dental it will be possible to establish youth therapeutic mentoring as a critical component of community services and continued support to children and families. About Alegre Dental – Located at 160 Market Street in Lynn MA, Alegre Dental has a dedicated professional staff and highly experienced team offering comprehensive and affordable family dentistry treatments. Using the latest of technology, our team of family dentists provide all major services from cleanings to crowns and whitening to cosmetic dentistry while adhering to hygiene protocols above the norm and all mandates of the American Dental Association, Occupational Safety and Health Association and the Center for Disease Control. About Longwood Care, Inc. – Longwood Care’s mission is to enrich the lives of children and enlighten the lives parents through empowerment, advocacy, inclusion, collaboration and education. Located at 21 Railroad Avenue in Swampscott, works to build strong families and communities by utilizing solution-focused, relational therapy that empowers parents and caregivers. With support from established organizations, city and state departments throughout Massachusetts we strive to transform child and family support networks by providing effective individual, couple, family and child focused therapy.